Is Barnes & Noble Salvageable? I predict Barnes & Noble will suffer the same fate that Borders did back in 2011 when it liquidated its remaining 399 stores. Their biggest obstacle is the web. Notice I didn’t say Amazon. If not Amazon, then Barnes & Noble would be facing a different online competitor. Barnes & Noble continues to struggle with its own online technology. Ditto for the Nook which has largely been a flop according to many business analysts. 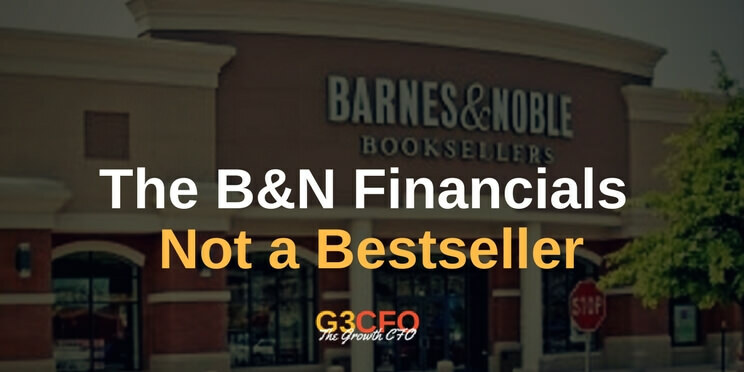 The only thing Barnes & Noble has going for it is that it has limited debt. But that will change quickly as operating cash flow has been consumed by ongoing capital expenditures. I couldn’t help myself. I did a little digging. These numbers are pretty darned ugly. Still want the CEO’s job? How Does the Fall of Barnes & Noble Impact Your Small Business? I’ve always been a fan of Porter’s Five Forces, and I was glad to see Host Analytics CEO Dave Kellog mention this strategic mental model in a recent blog post. Bargaining power of buyers – how does Barnes & Noble recapture market share when cheaper books are a click away with free shipping elsewhere? Can the brick and mortar behemoth survive not having a better web presence or reader device similar to Amazon? Then again, who needs a Nook when you can read books on any tablet? Barnes & Noble is a great study of a mighty giant falling before our very eyes. Every small business owner should take note. Just because you are experiencing great sales increases today doesn’t mean performance will last. Competition and threat of substitutes will always be lurking at your door. One of the keys to surviving and thriving is never being complacent. Ignoring external factors can ruin your business. In short, you need to be continually innovating. Perhaps Barnes & Noble thought it was when it introduced the Nook. Too little too late? Probably. I wish them luck, and I hope they can do more than hang on. But they have a huge upward battle. You hit upon so many good points in this article. Most importantly, a business does need to stay ahead of the curve and anticipate the needs of the next generation. I do love a good bookstore, even though I love my Kindle. Something about the environment is compelling. I believe that even Amazon has opened it’s own brick and mortar bookstores recently. So, there is something to the concept – the key is to figure out how to make it work. I do hope that BN sticks around – but the CEO definitely faces an uphill climb. Yes, I found that intriguing when Amazon opened their first bricks and mortar store in Washington. Like you, I hope B&N hangs in there. I love their store in Columbia, MO … just don’t go there as much thanks to Amazon.